Hating the red-themed bathroom and tiny shower in their new home, Peter Grech reveals how he and his partner Sam transformed it with a striking colour scheme, some well-chosen antique and online buys and a few personal touches to create a glamorous sanctuary on a tight budget. Read on to find out how they did it. 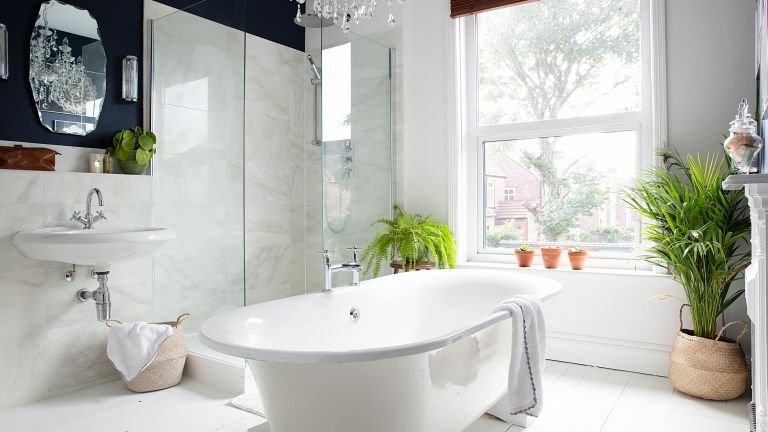 And, if you're also tired of dated tiles, an old-fashioned suite and poor plumbing, then check out our guide to designing a bathroom to get your project kickstarted. See all our real home transformations, too. ‘Because we didn’t want to spend a gigantic amount of money, we reused as many of the original fittings as possible, such as the bath and toilet. We changed the bath and basin taps for smart new designs that matched. It ties everything together really well. ‘The stool was another bargain find. I bought two for £24. I put towels on it when I am having a bath or my phone if I am playing some music. Or even just have a plant on. I am a bit plant obsessed; I think we have about 50 in the house.’ Plants, Ikea.